Artists in Partnership, Inc. presents the 7th Annual Barrier Beach Blues and Arts Festival 2015, an eclectic mix of Classic Blues, Americana, Soul and Roots music. The Festival runs from Friday June 12th through Sunday June 14th at the Long Beach Public Library, 111 West Park Avenue, Long Beach, NY. and other venues in the City. This year’s 7th Barrier Beach Blues and Arts festival boasts on Sunday at 3:00, the artistry of DEBBIE DAVIES, a two-time Best Contemporary Blues Artist award winner and top blues singer, songwriter and guitar player. On Friday at 8:00, award winning and internationally and nationally acclaimed TOBY WALKER, a roots music finger style guitar virtuoso, will be taking the stage. Saturday evening at 7:30, the Blues are Back with yhe HOODOO HONEYDRIPPERS straight outa Brooklyn! At8:30 join us for Grammy nominated and former James Cotton Blues Band member, SLAM ALLEN. 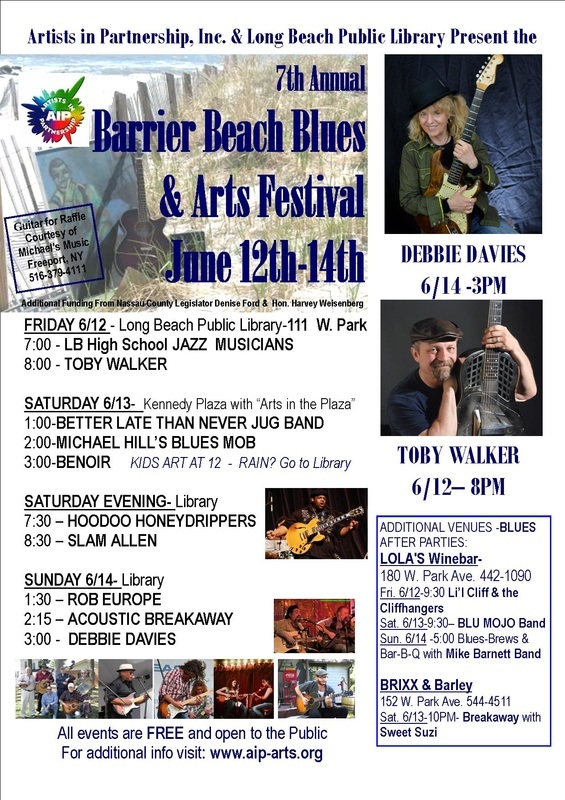 Additional performers include, on Friday, the LONG BEACH HIGH SCHOOL JAZZ MUSICIANS, and on Saturday afternoon at Arts in the Plaza starting at 1:00 join us for the BETTER LATE THAN NEVER BAND, MICHAEL HILL’S BLUES MOB and BENOIR. Opening for DEBBIE DAVIES on Sunday afternoon will be blues singer/guitarist, ROB EUROPE and the duo, ACOUSTIC BREAKAWAY featuring Howie Haber and Lou Carollo. Join us for a Blues and Bar-B-Q "wrap party" at LOLA's on Sunday at 5:00 featuring the music of Michael Barnett Blues Band. Join us at 11:00 in the Art Tent for a Children’s “Musical Instruments from Recycled Objects” Art Project. VISIT www.aip-arts.org for additional information about AIP and performers. Programs Subject to Change. All events are FREE. Seating is limited to 200 in the Library. Please consider joining Artists in Partnership, Inc. either online at www.aip-arts.org or sign up at the event.